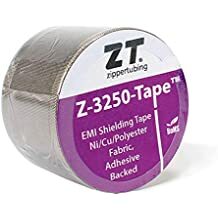 Prt S 7200 - Shielding Tapes And Wraps - Emi Shielding - Products - ZT | Zippertubing Co.
PRT® (S-7200) is an EMI shielded heat shrinkable wrap-around tubing providing secondary insulation and EMI hardening to new or in-service electrical systems. This variant of Zippertubing's PRT® (S-7200) product features a special "non-magnetic" metal EMI shield cloth material which contains no Nickel and provides outstanding shielding performance to electronics systems which are sensitive to magnetic materials. Non-magnetic shielding materials are extremely useful in EMI hardening components of sensitive GPS navigation systems and earthquake monitoring equipment that are easily upset by nearby magnetic materials. The materials unique wrap around feature allows the material to be installed without the need to remove or disassemble the associated connectors and end hardware common to most electrical cabling systems. PRT® (S-7200) wrap combines the advantages of high performance (SAE-AMSDTL23053/5A) Polyolefin heat-shrinkable tubing with the proven performance of Zippertubing's Z-7200-C non-magnetic, halogen-free and hypoallergenic conductive shield cloth. The material offers exceptional toughness, abrasion resistance, fluid resistant and has an operational temperature range of -55° to 135°C. PRT® (S-7200) is available in sizes to cover round or irregular shaped cable groupings from 0.090 inch up through 1.88 inch in the fully shrunk condition. ** For cable sizes beyond 1.88" diameter please contact the Zippertubing Engineering Department for a recommendation. Z-7200-C EMI Shielding fabric is a .005 inch thick woven Copper plated Nylon rip stop material with a proprietary Silver colored, non-magnetic corrosion resistant top coating. This product is fray resistant and contains no Nickel. Z-7200-C is Halogen Free and Hypoallergenic. The product is ideal for EMI shielding assemblies that cannot contain magnetic materials or where the shield will be handled extensively. Non-magnetic shielding materials are extremely useful in EMI hardening components of sensitive GPS navigation systems and earthquake monitoring equipment that are easily upset by nearby magnetic materials. Z-7200-C will not cause skin irritation like similar Nickel plated products. The thin woven construction makes it extremely flexible, yet very strong and is capable of operational temperatures of -40° to 150°C (200°C/minutes). Z-7200-C will provide shielding attenuation levels averaging 60dB from 10MHz to 18GHz. 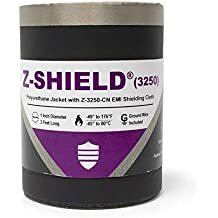 Z-7200-C can be incorporated on a custom basis into numerous Zippertubing standard product types like Z-Shield, Shrink-N-Shield, PRT-S, Shielded ZT-Tape and any of our standard jackets/closure types. A thin high temperature Acrylic transfer adhesive used to create permanent jacket closures on contaminated low surface energy plastic as well as metal materials. This specially formulated transfer adhesive and will withstand both low and high temperature extremes and bonds well to oil contaminated surfaces. When properly sealed and heat set the adhesive creates a strong semi-permanent bond that cannot be reopened easily. Attempting to remove and reset this adhesive after initial placement will destroy the strength of the material.